When browsing the internet there are plenty of legitimate reasons why you'd want to be anonymous, so our list of the best free privacy software will help you protect your privacy. As well as preventing third parties building up a profile of you, the best free privacy software can open up the web, granting you access to sites blocked in your country, to access region-locked content when you're travelling away from home, and to add a layer of protection when you use a public Wi-Fi network. With companies and governments looking to gather ever more information about your browsing habits, now is the ideal time to look into free privacy software. Although the software in this guide is free, it doesn't mean it lacks features, or will that your privacy will be compromised. 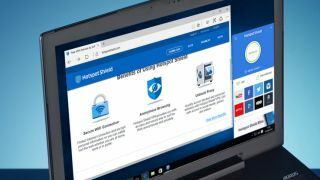 Every piece of software in our best free privacy software list is guaranteed to help you browse the internet safely and securely. If you would prefer to keep your personal details private, a VPN or proxy tool will help. You can check out our best free VPN guide or see our guide to setting up and maintaining a VPN. We have reviewed more than one hundred VPN providers, both free and paid and our top recommendation right now is ExpressVPN. That's because, while it's not free, its speed and robustness as well as the servers it has in nearly 100 countries worldwide and the multitude of apps which accommodate almost any of your devices. It's not free, but it does come with a 30-day no-quibble money back guarantee and we highly recommend trying it over any free options. Prices start from just $6.67 per month! Tor Browser is probably the best-known anonymous browsing tool out there, and it is described as a 'censorship circumvention tool'. Tor Browser has a vast following in the online privacy and security communities. It works by bouncing your communication through numerous encrypted nodes on the internet, making it impossible to determine your location or other identifying information. Tor Browser employs complex technology, but is refreshingly accessible. It's based on the same code as Firefox, and guides you through the process of getting online one step at a time. It uses different connection methods depending on what you're trying to achieve, but there's no need to understand the details because it's all taken care of for you. This combination of effective protection and ease of use makes Tor Browser the best free privacy software you can download today. Privoxy is a web proxy tool that's available not only for Mac, Windows and Linux, but also Android and iOS. It is a tremendously powerful tool, but you'll need to invest a little time and effort to get it up and running. However, one of Privoxy's key features could also be a drawback for new users: it gives you very granular control over privacy settings, and configuring them is very much a manual process. There's a helpful quick start guide available, but it has the potential to be off-putting. That said, if you're happy to persevere, this free privacy software lets you set up advanced filters that will not only ensure you remain anonymous online, but also protect you against unwanted ads. Hotspot Shield is available in two flavors: a free, ad-supported one, and a paid-for version that offers unlimited bandwidth. Hotspot Shield hides your IP address and provides encrypted traffic tunnelling (ideal for use on public Wi-Fi networks) to improve security and ensure privacy. You may not want to use Hotspot Shield at all time. For instance, you may only be interested in using it to access certain sites that are blocked in your country. In this case you can create shortcuts to individual sites in the Hotspot Shield window, which will enable protection before launching the sites. Protection can also be toggled on an off with a single click. The paid-for product, Hotspot Elite, only costs a few dollars or pounds a month, but it's worth trying the free edition first before opening your wallet. The premium version's additional features, including ad-free browsing and dedicated customer support, make it a tempting proposition. In addition to anonymous browsing, free VPN client TunnelBear can also be used to bypass traffic-shaping and throttling put in place by ISPs. The free version of TunnelBear gives you up to 500MB of data each month – although a TechRadar deal ups that to 5GB – but if this isn't enough, unlimited data is available for a subscription fee, with prices starting at US$5 per month (about £3.90, AU$6.90). Configuration is incredibly simple, and TunnelBear's free privacy software can be used with any browser. It's probably the most accessible VPN tool there is, and is just about impossible not to recommend. Windscribe is another multi-platform VPN tool in this list, where free users have access to one of the biggest data allowance in the business. The free plan offers 10GB if you register (2GB if you don't) which for occasional use should be perfectly adequate. If not, there are paid plans that grant unlimited data and additional configuration options, with prices starting at $4.08 a month (about £3, AU$5.70) with an annual contract. Configuration is simple as all you need to do is to click one button to turn the VPN on and you're good to go. Depending on your region, the software will automatically connect you to the best location, giving the impression that you're browsing from another country. The downside of using Windscribe (free plan especially) is that the connection speeds can be average and inconsistent. Still, the pros outweigh the cons, so the service is well worth a try.